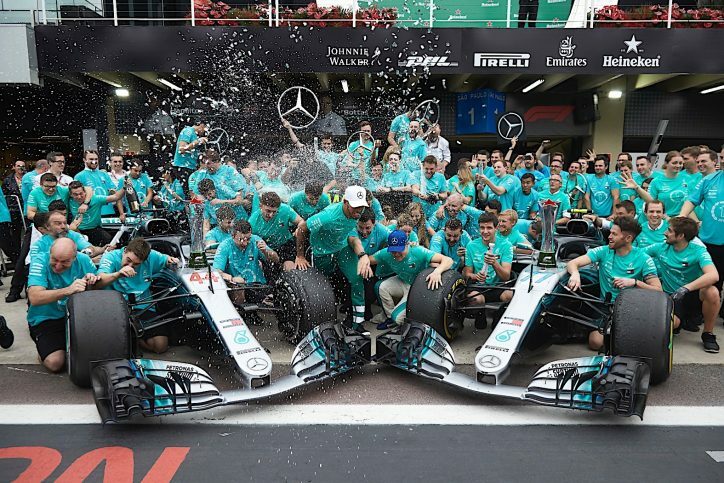 Winners of the constructors title for the fifth season running, there seems to be no stopping Mercedes F1 on track. Lewis Hamilton is now a racer who can be backed years in advance to win the title, and perhaps the only regret of Silver Arrows fans is that the team spent such a long hiatus out of the game. Between 1956 and 2009, the name of Mercedes was absent from the list of Formula 1. Yet, there were some fantastic talents on board in the mid-1950s, with Juan Manuel Fangio and Stirling Moss being prominent names in that regard. They form the first part of this nostalgic list of famous Mercedes hat tricks—by which we mean a single Mercedes driver being classified as the pole starter, the fastest lap setter, and the race winner. In a precursor to the breakout inter-team rivalry of Lewis Hamliton and Nico Rosberg, Stirling Moss and Juan Manuel Fangio were both teammates and rivals, and it was between the Brit and the Argentine for that year’s title. Fangio had in fact completed a hat trick in the previous year’s Belgian Grand Prix—just weeks before he defected from Maserati to Mercedes. Victorious in three of the preceding five Grands Prix, Fangio was chasing a second hat-trick in as many years, but that accolade would instead fall to Stirling Moss. The Brit had yet to secure the fastest lap or a starting position on pole—let alone win a race—but he went lap for lap with Fangio in qualifying, getting pole position by an encouraging margin. Only nine drivers of a possible 25 finished the race, but amidst the turmoil of incessant retirements, Moss produced a regal drive, finishing just 0.2s ahead of Fangio. 1955: Fangio et al in action for Mercedes (no audio). They say that you never forget your first time. It was in Mercedes’ first winning season of modern times that a driver scored a hat trick under the Silver Arrows, and nobody else but five-time champion Hamilton could have done it with such style. It was Rosberg who struck the first blow the previous week, but wanting to halt his title-less spell at six years, Hamilton hit his stride quickly and ruthlessly. Qualification was a breeze for Hamilton, whose 33rd career pole put him on terms with the all-time record British holder Jim Clark. Ultimately, it came as no surprise to see Hamilton win from pole by an unbelievable 17s, never being remotely troubled by the chasing pack. Thanks to the power of Mercedes, he is already odds-on in F1 betting markets to win his sixth world title, and en-route to his second, Hamilton repeated the feat later on in successive races – at Italy and Singapore. A perfect lap from Lewis Hamilton. As Mercedes grew, so did Rosberg, and his first hat trick in a Mercedes was inevitable. It came in the Mexican Grand Prix of 2015, at a time when Lewis Hamilton was already permitted to breathe easy, having already secured the title at Indianapolis in the previous round. That said, nothing should be taken away from a victory at a circuit that had been unused for 23 years, and was unfamiliar to every driver. Rosberg managed to beat Hamilton by just under 0.2s, and whenever both men locked out the front row, Hamilton was the favorite every time. Both men dueled magnificently throughout, with the second-placed Hamilton finishing >14s in front of podium completer Sebastian Vettel. With a winning margin of just over 1s for Rosberg, it seems as though being in pole really was the difference – but so too was a blistering fast lap of just 1.20s.